"DIN" is an abbreviation of "Deutsche Industrial Normen." This is a German standard that has been adopted internationally as an optical standard used in most quality microscopes. The focal tube length of a DIN standard microscope objective is 160mm. 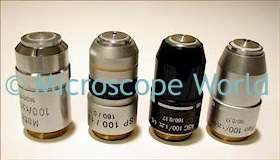 A typical DIN standard microscope objective lens has 0.7965" (20.1mm) diameter threads, 36 TPI (threads per inch), and 55° whitworth. The former standard was RMS ("Royal Microscope Society"), which had a longer tube length (170mm). Most DIN optics are interchangeable. However, DIN and RMS objectives are not interchangeable. If you have RMS objectives and want to use them on a DIN objective nosepiece you would need to use an adapter, and even with this adapter the microscope would not be parfocaled. You can learn more about how to parfocal microscope objectives here.